We were delighted to be featured in the February issue of PASTA & ITALIAN FOOD magazine. This is the magazine of The Pizza, Pasta & Italian Food Association (PAPA), originally formed in 1977 as the Pizza Association, but changed its name to include pasta and Italian foods in the late 1980s. Today the association is the only formal trade body in the UK representing the broad pizza, pasta and Italian food and drink industry. Back in 2008 Irfan Nakip and Huseyin Borachan, the owners of Pizza Time had an existing, successful pizza outlet when they asked Tangent Partnership to redesign the whole interior, exterior and signage in a way that would allow them to expand their concept into more outlets. Their plan was, initially to grow organically by opening more outlets owned and operated by them, with a view to offering the brand on a franchise basis once they had proved the concept in a number of locations. To be successful, any concept requires a strong core proposition. In food service this can be expressed in terms of quality, value, service and cleanliness, (this is the original Ray Crock McDonalds mantra). Pizza Time already had this strong core proposition, so our task was to provide a visual presence that would support and promote these qualities. In effect, we were looking for ways of expressing the Pizza Time brand values in the use of materials, finishes and design. We commenced the project by carrying out some basic research into the market. 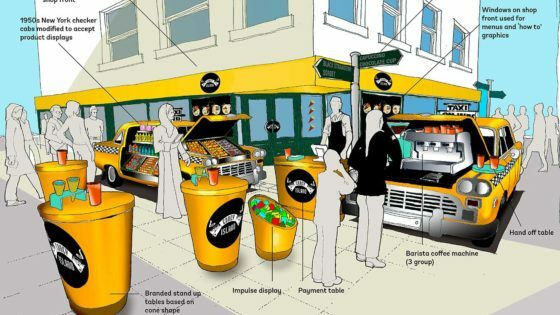 It revealed that on any suburban High Street you can find a multitude of hot take-out food; shops which eke out a living, but because they are often dull, dark and possibly grubby, will never inspire enough confidence with the public to become a respected brand, even within the local area. Our clients agreed with our view that we needed to differentiate the Pizza Time offer from these also-rans that can be found on the High Street. Working closely with them, we developed a clear design brief that would lead to a strong physical presence which is highly visually accessible and inviting, using large windows affording views into a light, bright and perceivably hygienic preparation and cooking environment. The continuity of running finishes through the shop front into the front of house area and onto the service counter works to draw the customer in. Materials were selected that support the clean, hygienic concept but that are also warm and natural, reflecting the wholesome and natural nature of the raw ingredients and the pizzas baked within the outlet, with fresh dough produced every day. Other considerations in the selection of materials and finishes were high quality and durability. We aimed to endorse the quality of the brand and ensure that the shops retained their initial appearance with a minimum amount of maintenance. 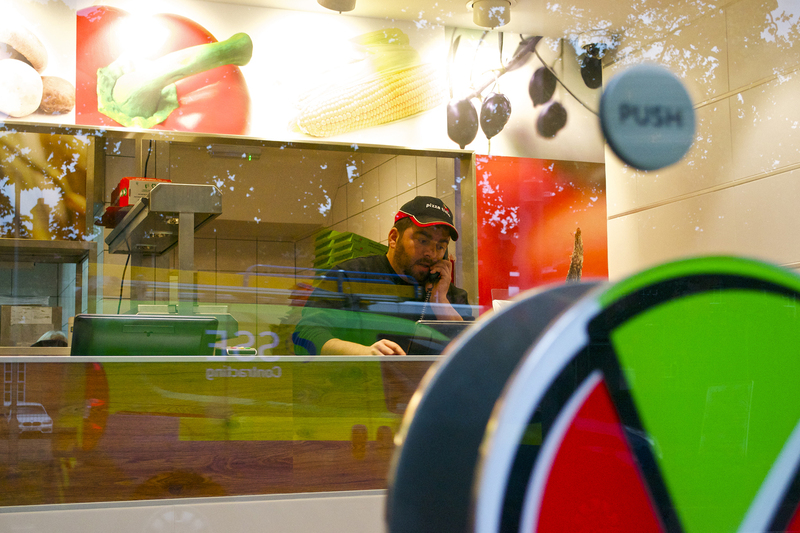 The Pizza Time success story is largely based on the dough which is freshly mixed, proved and formed in each store. Obviously sites vary in configuration but they are always planned to allow a clear flow of production from dough mixing, through to the finished product leaving the unit. In the more recent outlets we have adjusted the flow of the production process so that customers and passersby can see the dough forming and toppings being applied. Our design approach employs a clean, bright and modern look, using fresh food images to convey the qualities of the product. Large graphic panels are used within the shop to stress the fresh nature of the ingredients, while introducing splashes of colour into the interior. We have also recently redesigned the brand logo and managed its trademarking, and are currently working on the design and build of the Pizza Time website and online ordering system. 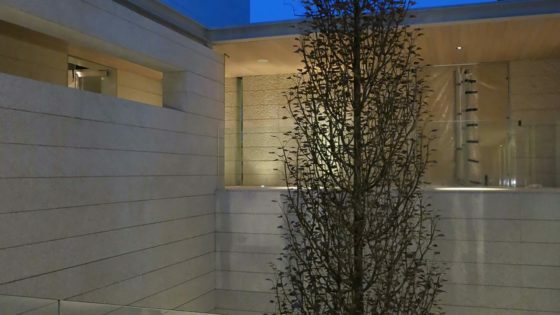 Important aspects of the front of house design are to use a relatively high level of illumination, using fittings with good colour rendering characteristics, and a sound absorbing ceiling system that aids clarity for orders. 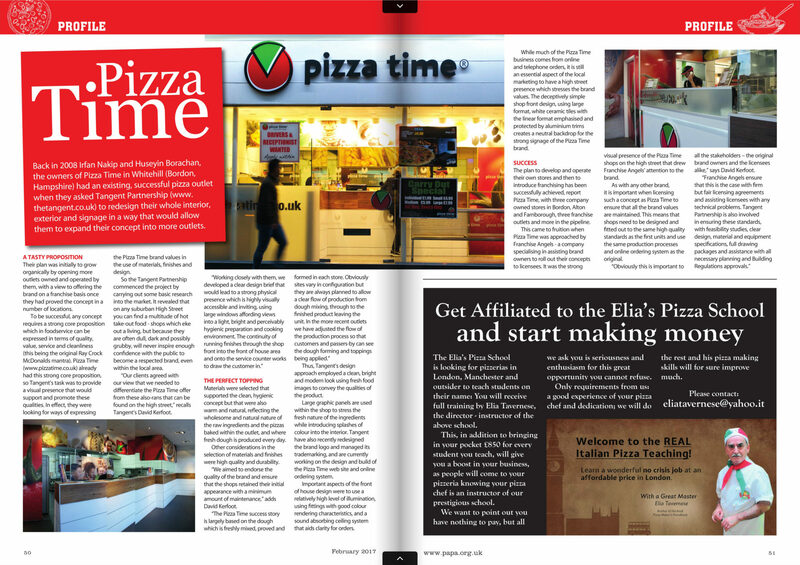 While much of the Pizza Time business comes from online and telephone orders, it is still an essential aspect of the local marketing to have a High Street presence which stresses the brand values. The deceptively simple shop front design, using large format, white ceramic tiles with the linear format emphasized and protected by aluminium trims creates a neutral backdrop for the strong signage of the Pizza Time brand. The plan to develop and operate their own stores and then to introduce franchising has been successfully achieved, with three company owned stores in Bordon, Alton and Farnborough, three franchise outlets and more in the pipeline. This came to fruition when Pizza Time was approached by Franchise Angels, a company specializing in assisting brand owners to roll out their concepts to licensees. 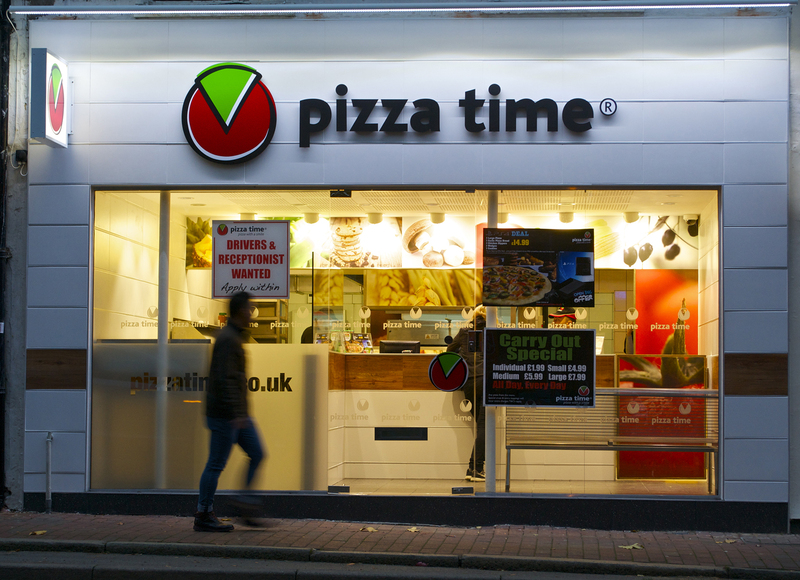 It was the strong visual presence of the Pizza Time shops on the High Street that drew Franchise Angels’ attention to the brand. As with any other brand, it is important when licensing the concept to ensure that all the brand values are maintained. This means that shops need to be designed and fitted out to the same high quality standards as the first units and use the same production processes and online ordering system as the original. Obviously this is important to all the stakeholders – the original brand owners and the licensees alike. Franchise Angels ensure that this is the case with firm but fair licensing agreements and assisting licensees with any technical problems. 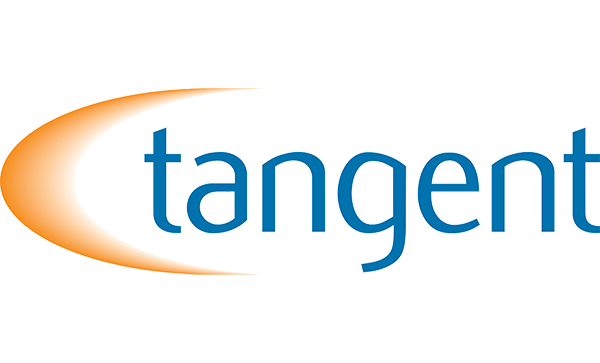 Tangent Partnership is also involved in ensuring these standards, with feasibility studies, clear design, material and equipment specifications, full drawing packages and assistance with all necessary planning and Building Regulations approvals. If you wish to manage a Pizza Time franchise or to rejuvenate your own outlet with the Pizza Time management benefits then contact Pizza Time (Franchising) Ltd on 01252 720 822.